Forget electronics and appliances, guns were apparently the must-have item on Black Friday this year. FBI statistics show more than 200,000 people requested background checks to buy guns on Black Friday, up nine percent from last year. At Stoddard’s Range and Guns in Atlanta, Nikki Bradley is honing her shooting skills. She said she’s never been a “gun person” but started shooting a few months ago after a friend was carjacked during Atlanta’s slider crimes. She isn’t alone in wanting to own a gun. The FBI received more than 203,000 background check requests for gun purchases on Black Friday, setting a record for a single day. Stoddard’s sales were 18 percent higher this year than last year on Black Friday. “Handguns seem to be the most popular items, but we sell a lot of rifles as well,” said Ken Baye. Baye, who owns Stoddard’s, said there are several reasons guns flew off the shelves. “We have a number of people who come in because they’re nervous about what they see going on around them, and they want to provide a greater level of protection for themselves or their family,” he said. 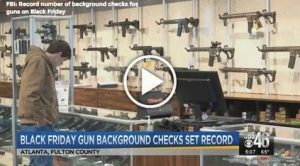 The number of background checks doesn’t reflect the actual number of firearms sold on Black Friday, however. One person with one background check can buy several guns.